Spencer Kay is 47 and cannot wash, feed or dress himself - but put a 3,000ft mountain in front of him and he will comfortably conquer it. While every day is a challenge for a man who has autism and a cognitive age of three, set him free in a mountain range and Spencer comes into his own. "It makes him happy and there is few things that Spenny can comprehend," said sister and carer Charlotte. It has been a 40-year battle to keep their eldest brother out of mental institutions. And while he has limited communication, seeing Spencer happy on the hillsides of north Wales is all the thanks and justification they need. "Spencer has severe anxiety disorder," added Charlotte. "And for anybody who is feeling stressed, depressed or have any kind of mental health problems, intense physical exercise is incredibly powerful and the effects it has on him are wonderful." The 39-year-old has taken over from her mum to care for her big brother, whether it's making him breakfast or walking with him among the mountains of Snowdonia. She and husband Simon have also decided not to have children so Spencer can flourish in the freedom of living with family. Mum Nicola - known as Nicky - had Spencer aged 19 in 1972 and spent her life fighting to keep him beside her in the family home on Anglesey. He was aged two when doctors realised he had learning difficulties and it was first discussed whether Spencer should be institutionalised. "Born with severe autism in the 1970s, it was an unforgiving era for those with any kind of mental challenges," said brother Mikey. As Charlotte explained, her mum fought an "endless battle", not just with Spencer "because he was difficult and she didn't always know how to deal with him" but with the health authorities. "He was her son, her responsibility," said Charlotte. "She had so much love in her that there was no other choice than him to stay with her." Nicky's way of helping her son was walking - and plenty of it. "It's very therapeutic and Spencer appreciates it," said Charlotte. "I think to a much deeper level because of his lack of understanding elsewhere." 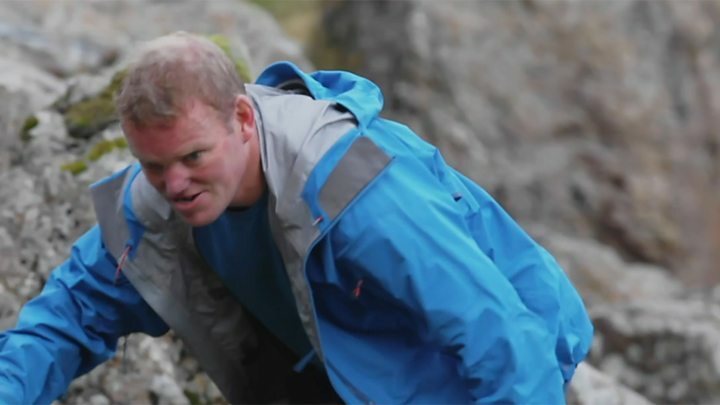 Younger brother Mikey has made a documentary about his family's "almighty struggle to get Spencer the only medicine he needs - his freedom to roam these epic mountains". "Put Spencer onto a mountain and he turns into a powerhouse," said the 45-year-old former helicopter pilot turned journalist. Social services and health professionals, however, started to once more discuss Spencer's care as his behaviour deteriorated in his late 20s. He was sectioned under the Mental Health Act in 2001 after being accused of being aggressive towards a child, and spent time in a mental health unit on Wales' mainland about an hour from home. "Mum was heartbroken, she had devoted her life to someone very vulnerable," recalled Charlotte. "I visited him and Spencer was behaving really oddly. What was really sad was he would wait by the window for mum to come and visit." His family understand routine is key and, as brother-in-law Simon said: "When you upset the routine, that just throws his whole world into chaos." Spencer struggled and his carers acknowledge an institutionalised setting "wasn't the best thing for him" nor was being looked after in the community by those who he didn't know and who didn't understand his needs. It also transpired, the family said, that there was a flaw in the paperwork that had led to him being detained, and the section was not valid. So the authorities came up with a bespoke proposal for in-house care with carers he knew and liked. Spencer blossomed before their family's world was turned upside down in 2007 - his mum, "his world" was diagnosed with cervical cancer. A two-year battle followed before Nicky died in 2009 - and once again Spencer's care was thrust into the forefront of the family's mind. Charlotte stepped forward as a joint carer in a similarly selfless way her mum did - despite concerns. "I had scepticism about the commitment required of a young women to commit her life to helping her brother," said Dave McDonald, who was in charge of assessing Spencer's care for the North Wales Health Trust. "It takes a lot of soul to do that." Charlotte, like mum, knows what makes Spencer tick and what makes him happy - basically, walking. "She has stepped up and he trusts and loves her more than anyone else in the world," added fellow carer Steve Hughes. But she acknowledges it's not without challenges. "Spencer is gentle when you learn what Spencer needs and work out how he is interpreting the world," said Charlotte. "I would love babies, and children would be a lot of fun to have around. I don't resent Spencer but if I had a child that needed 24-hour care, that'd be too much. "So Simon and I have decided to not have children. So the future for Spencer is he will stay with me and Simon - and we will get old together." My Autistic Big Brother and Me is on BBC One Wales on Tuesday at 10:35pm or catch up iPlayer.